These are so good! So easy and can be prepped ahead of time. I've been trying to make an effort to do more meal prepping on Sunday and these are perfect for that. 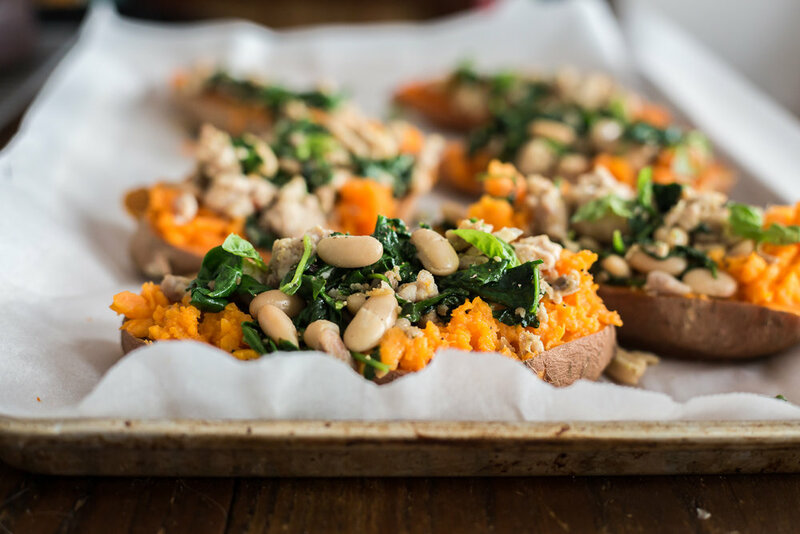 Just bake the sweet potatoes and prepare the filling ahead of time and stick them in the fridge. Then you can stuff the potatoes when you are ready and bake in a low oven until they're hot throughout. These babies will definitely be in our regular rotation. So delicious and colorful! Preheat oven to 375. Place potatoes on a baking sheet and bake until soft, or a knife easily pierces the skin, about 45-60 minutes. Remove from oven and let cool. In a medium skillet brown the sausage. Using a wooden spoon to break it up. Once that is cooked add the spinach and beans. Keep cooking on low till the spinach is wilted. Season with salt and pepper. Turn off the heat. Slice the sweet potatoes open the long way and gently mash up the inside and make a little well in the middle for the filling. Spoon the filling into the each potato. Top with whipped ricotta and freshly torn basil! Place 1 cup of ricotta and 2 teaspoons of olive oil a pinch of salt and crushed red pepper flakes in a food processor. Blend until smooth, about 30 seconds.